Ronda Rousey the character has some problems. She smiles too much. She can’t act. Her second feud started at the NBC upfronts. But last night, in her first singles match, Ronda Rousey the wrestler looked like she’s going to be pretty damn good. 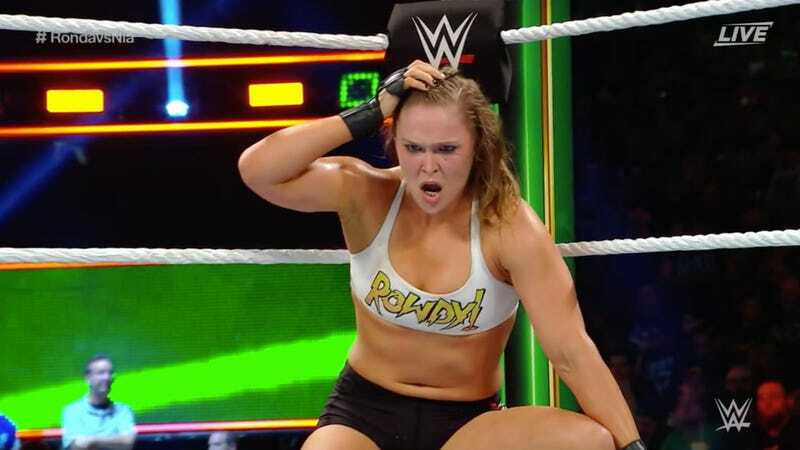 Rousey faced Nia Jax for the Raw women’s championship at WWE’s Money in the Bank pay-per-view last night. She won by DQ when Alexa Bliss, who’d won the women’s MITB match earlier in the night, interfered when Rousey was about to lock on her armbar submission on Jax. Bliss attacked both of them with the briefcase, cashed in and pinned Jax to become the new Raw women’s champ. But before the ending, the match between Jax and Rousey was pretty good! It was an entertaining match on a card full of them (even if the MITB stipulation is getting stale). Rousey sold for most of the match; Jax opened the match by ramming Rousey into the corner and controlled most of the action. The match was just Rousey’s second televised match (she’s also done some house show tag work). It told a good story: Rousey, a newcomer to wrestling, struggled to figure out how to wrestle a much larger opponent. Rousey may not be much of an actress, but she does appear to be able to sell moves well. As Jax tossed her around the ring, Rousey occasionally attempted submissions. They’d briefly work before Jax regained control. Rousey actually looked pretty good selling moves. She looked like she was in a real fight. She may have made some mistakes. But, overall, she looked like a pro wrestler doing pro wrestling. Jax was good, too. Last April she was dropping Charlotte Flair on her head. Last night she controlled the match against a neophyte and it worked. (She even had a great Samoan drop!) And because Rousey is so new, and already a celebrity, even a bearhug spot was interesting. The ending of the match was pretty good. It’d probably be too much for Rousey to win the title in her first match, but WWE found a way out of it: Bliss attacked Rousey, giving her the win. Bliss’s cash-in and title win now leads to a number of good storylines. Rousey has a new feud with Bliss and unfinished business with Jax. The booking was good. And Rousey wasn’t out of her element. There are plenty of ways WWE can go with this, all of them pretty interesting. Two matches into her career, and Ronda Rousey is already a pro wrestler.